Football’s leaders need to show they can bring about “lasting change” in the fight against racism, says outgoing Kick It Out chairman Lord Ouseley. Lord Ouseley has said he will stand down as head of English football’s anti-discrimination body next year. It comes as police investigate alleged racial abuse of Manchester City forward Raheem Sterling in a game at Chelsea. Lord Ouseley said progress has been “offset by the wider society afflictions of prejudice and hatred”. The 73-year-old, who founded Kick It Out in 1993, said: “I have thrown challenges at the leaders in football and they need to show their hands – they need to show they are capable of bringing about lasting change if they all come together out of their silos and take a dynamic and coherent approach to meeting the equality challenges. 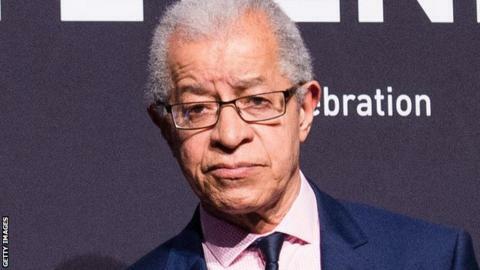 Lord Ouseley, who was the former chair of the Commission for Racial Equality, says there has been “slow progress” tackling racism since Kick It Out was started. He also said he has been trying to step down for 10 years, but “no-one else has stuck their head above the parapet to lead the organisation”. Kick it Out is funded by the Football Association, the Professional Footballers’ Association, the Premier League and the English Football League. The FA used England’s friendly with Switzerland in September to mark 25 years since Kick It Out’s formation. The game at Leicester City’s King Power Stadium was the first international to honour the organisation.